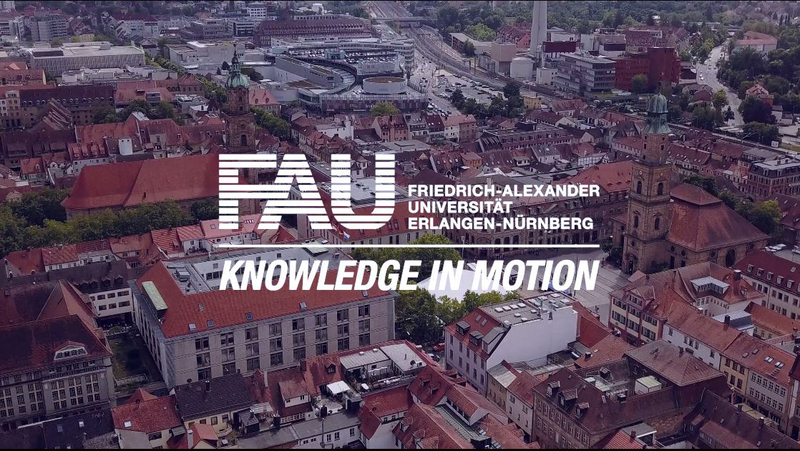 The two Erlangen-based Fraunhofer Institutes IIS and IISB, and Friedrich-Alexander-Universität Erlangen-Nürnberg (FAU), together with Siemens and other partners from industry and research, are combining their strengths in a new centre for electronic systems: Leistungszentrum Elektroniksysteme (LZE). The aim is to strengthen the Nuremberg Metropolitan Region’s position and international reputation as Germany’s leader in the field of electronic systems. Prof. Dr. Albert Heuberger, head of Fraunhofer IIS, Prof. Dr. Lothar Frey, head of Fraunhofer IISB, and Prof. Dr. Joachim Hornegger, President of FAU, together with the Bavarian State Minister of Economic Affairs and Media, Energy and Technology Ilse Aigner, Prof. Dr. Alexander Verl, Vice President of Fraunhofer-Gesellschaft, and Prof. Dr. Siegfried Russwurm, a member of the Managing Board at Siemens AG, presented the concept for the new Leistungszentrum Elektroniksysteme at the Bavarian Ministry of Economic Affairs and Media, Energy and Technology. LZE’s research will focus on two key technologies: power electronics for the transformation and distribution of electrical energy, and low-power electronics for applications with minimal energy consumption. 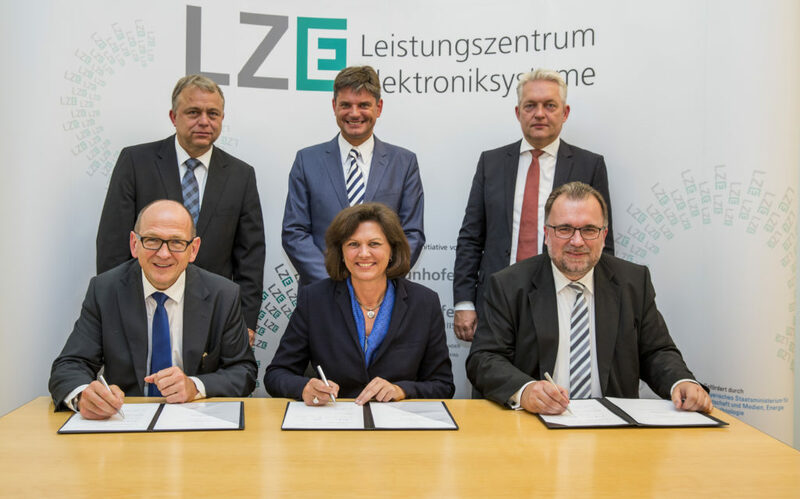 The Bavarian Ministry of Economic Affairs and Media, Energy and Technology is providing 5 million euros in funding for LZE’s pilot phase. A further 5 million euros are being provided by industry, with another 4.8 million euros in Fraunhofer funding. The initial four pilot projects demonstrate the comprehensive range of research skills at LZE and will work on finding innovative solutions to issues that are of relevance in industry. The researchers working on the project ‘DC-Backbone mit Strom-Gas-Kopplung’ (DC backbone with power-to-gas technology) are developing a new energy storage system. Their system will store energy seasonally in liquid organic hydrogen carriers (LHOC) and will be able to integrate renewable energies more flexibly into the grid thanks to this storage system and another which uses lithium-ion batteries. They also aim to use a local DC network to make the power supply in, for example, industrial or office buildings more compact, more efficient, and therefore less expensive. The goal of the project ‘Energieübertragung in schnell bewegte Systeme’ (integrated power and data transfer for fast-moving systems) is to combine inductive (i.e. wireless) power transfer with data transmission in fast-moving parts. Examples of areas where this technology could be applied include wind turbines with electronics integrated into the rotor blades, highly automated manufacturing systems, and robots in which energy and information are transferred through joints. Until now, slip rings or flexible cables have been used for this purpose, but they are affected by wear and restrict movement considerably. This is not the case with the LZE researchers’ new system, as wireless transmission is not affected by vibrations or environmental factors (such as lubricants or oil) and, at the same time, allows much greater movement. The researchers in the project ‘Low-Power-Elektronik für Sport- und Fitnessanwendungen’ (low-power electronics for applications in sports and exercise) will begin by developing advanced prototypes based on RedFIR® real-time tracking technology and the FitnessSHIRT, which measures heart rate and breathing. These prototypes will combine the two technologies in so-called LokVitalTags. 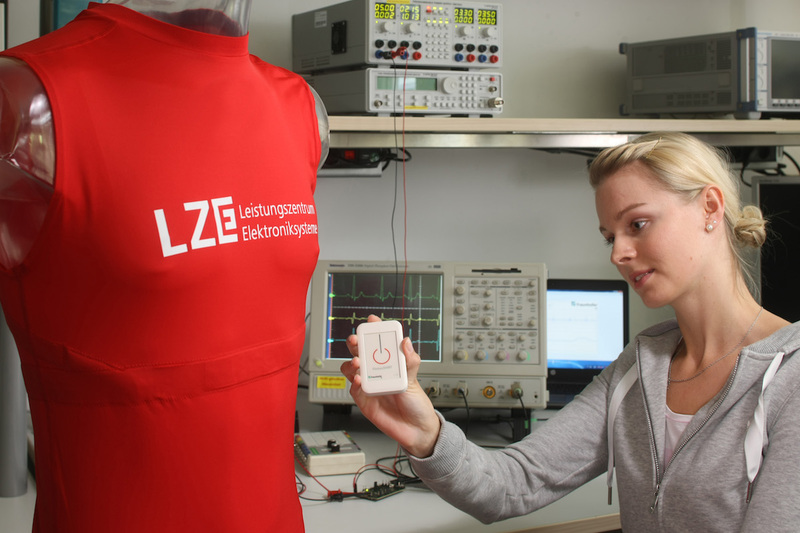 The t-shirt will record position and movement data at the same time as health data such as ECG or breathing. These values can then be used by the coach or the athlete themselves to develop the best possible training concept. The researchers will also be working on new algorithms for interpreting ECG signals, such as to analyse heart rate variability or identify arrhythmia. The project ‘Energieautarkes Asset-Tracking-System für Logistikanwendungen’ (self-sufficient asset tracking system for applications in logistics) is working on powerful logistic solutions. The researchers are developing a low-maintenance tracking system that is able to locate and track goods in a warehouse. To do this they will design and use energy-saving radio receivers – called wake-up receivers – that only require one-thousandth of the amount of energy of a light-emitting diode (LED). This enables a self-sufficient power supply through energy harvesting, as the electricity for the radio electronics is generated though differences in temperature and minute mechanical vibrations.